In our hobby we all strive improve our skills to be a great racer. To achieve this there are many aspects that you can focus on to improve your skills. The obvious one is actual track time to brush up on your controller skills, but the other side is understanding tuning theory to allow you to make changes to your car that can adapt the handling to compliment your driving style. RC Crew chief is a piece of software that can help you really drill down into the actual science of handling, and it is also unique in that it can actually show you how your actual chassis will respond to handling changes when you are not at the track. 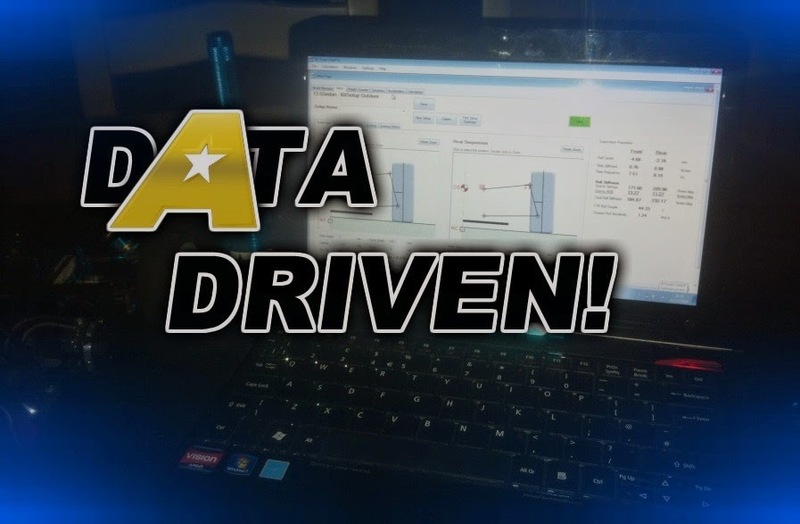 The program is quite involved, but I will give you an overview on the areas and some of the results that I have found with using this excellent piece of software over the last few months. Rc Crew chief runs on Windows PC's from XP service pack 3 onwards, so it is available for pretty much all current windows machines. 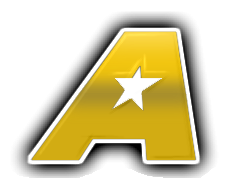 When you buy the software you are able to install it on a couple of machines, so you can have it on your desktop PC and also your laptop. This allows you to take it trackside and save settings etc. For those that want to try before you buy, you can also download a trial version. When you load up the software you start with the Model Manager. 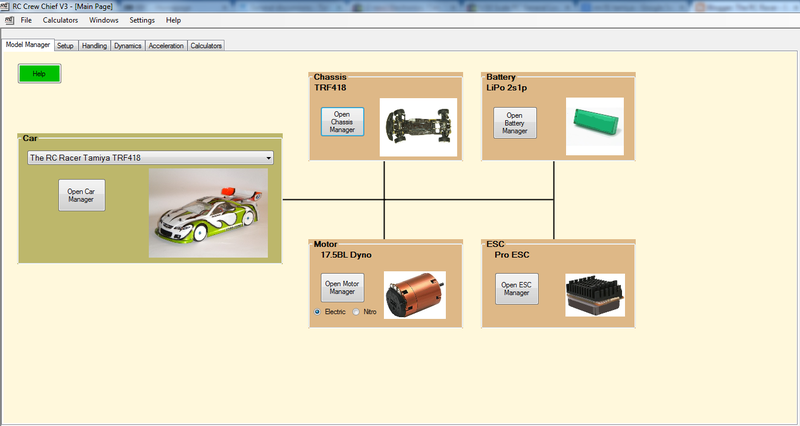 Here you can set up the basics, you can open the chassis manager. This allows you to either load some of the pre-existing chassis models (Click here to see) These cover a wide range range of On-road and Off-road chassis including most of the latter TRF models. If your car is not on the list you can create your own chassis file. You basically just need a few standard pieces of set-up equipment (Digital Callipers / Verniers) and you can take measurements of the stock chassis set-up you have and enter the correct values in. It is quite complex and will take some time, but it will give you better results when trying to understand what your changes have done. For me, owning the TRF418 it was very easy to get a TRF418 model sorted. The battery / motor and Esc managers I just used the generic models included for my overall car equipment (17.5 Blinky) but again you can tailor these even more to be specific to your motor etc. Once you have a basic car set-up you want to save it out, and then you can start creating set-ups and delving even deeper. The first thing to do is to transfer your actual race chassis set-up into the program. This will give you your base to create individual set-ups that you can save individually, and this is where the fun really begins. In the set-up section you have 3 main areas with their own tabs to select. First up I selected the Suspension tab. 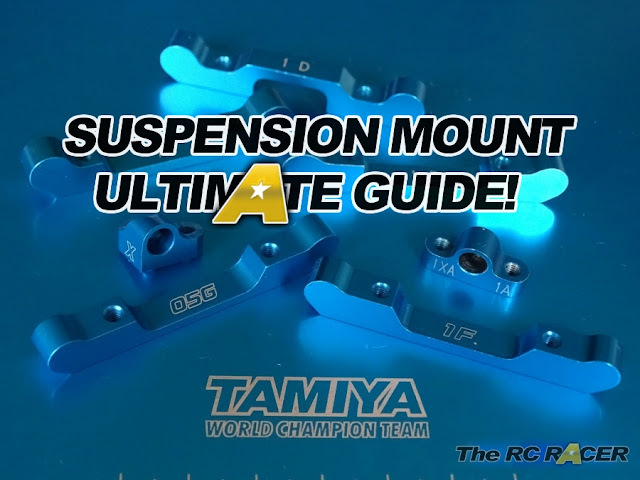 I transferred my current suspension set-up in the available sections here. I also zoomed in and clicked the correct inner and outer camber link heights and lengths. When you select the Spring / Shocks / ARB (Anti Roll bar) section you are able to position the shocks to the positions that you have them on your towers. You can also select the spring rates from a selection of pre-defined springs. This includes Tamiya, HPI and also the Ride springs. The only notable ones missing are the Yokomo progressive Long TC springs. As you can see once you do this it shows you a range of values, including the F/R Roll Couple and the chassis roll sensitivity. These are useful values to know as the FR Roll couple determines how the car transfers the lateral load from front to rear (And the subsequent handling balance). 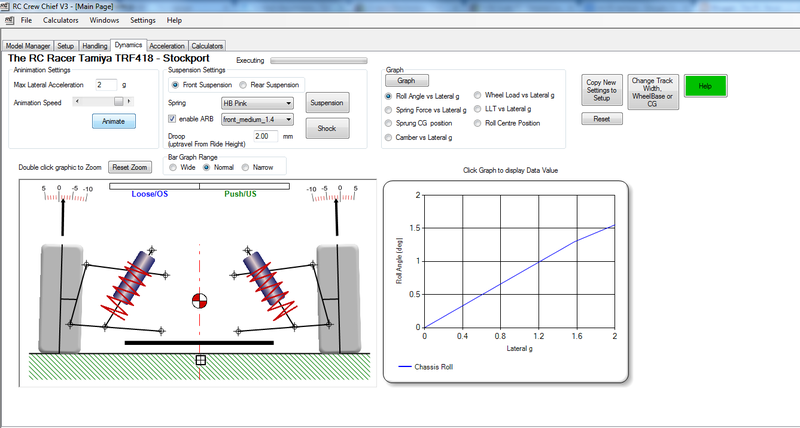 The Chassis roll sensitivity shows how much your car will roll given a certain cornering force. You can monitor the changes here to see if your car is susceptible to grip roll or wearing the tyres unevenly. This is one of my favourite sections of RC Crew Chief. 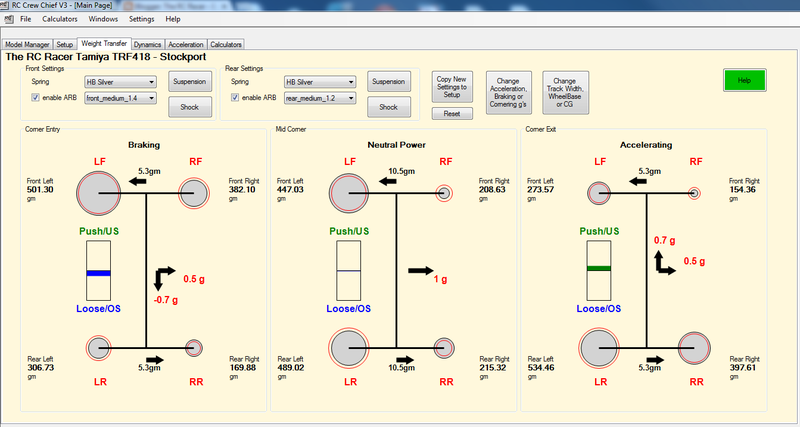 The handling section shows how the car will act in a range of scenarios when running in the 3 scenarios of Braking, Neutral power and Accelerating. In the picture above you can see that I have set up the lateral g's to show how the car will react when it is cornering to the right. You can see the weight of the car moves to the front, with most of it moving across to the outer tyre, then as the car is rolling around the apex the load is similar on both outer tyres until the throttle is applied and the car lauches out of the corner with the rear tyres pushing the car and the front inner especially not having much grip on the track. The important thing here is the gauge on the side of each of the corner scenarios. You can see that the car is loose on the way into the corner (loose = Oversteer), its slightly loose when on neutral power and then its pushing (under steering) on power. Personally I like a car to over-steer a little when braking into a corner. fast corners are usually neutral as I do not brake, however on tighter infield sections I want to throttle for as long as possible before hitting the brakes, hook the rear out and then catch it to bring the car to a controlled neutral state before leaving the corner. As you can see, the above looks good, however the neutral setting still has a slightly loose handling property, this will make it difficult to catch the car and can sometimes lead to me messing up a corner. Neutral power is much more stable now. So, when just sitting at my laptop, I wondered if a stiffer front spring would help. I changed the front spring to HPI Pink from HPI Silver and the graphs updated. 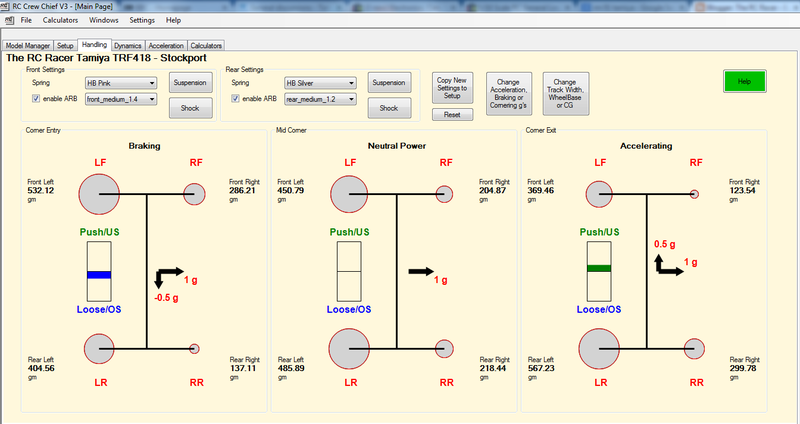 As you can see the middle Neutral power section now illustrates that the car will be stable when on neutral power. I made the change on the car and took it to the track and the car felt much more consistent, with the rear end being much more in check when I threw the car into a tight 180. 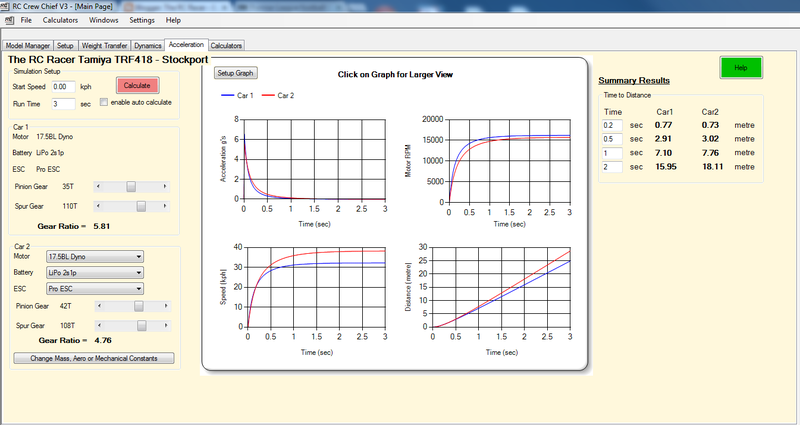 Here you can run an animation that will show you how a car will handle as it rolls left and right when on acceleration. Here you can really see the effect of droop on the cornering force. Sometimes just adding a small amount more at the front can really help you tune a car to run quickly through a chicane. This section is a great sanity check on how to adjust the gearing of your car for a track. I can use this section to understand how to best gear the car depending if the track is tight or more open. Here you can see how far the car has travelled over distance. Sometimes a few centimetres extra out of a corner are better than top speed a the end of the long straight. 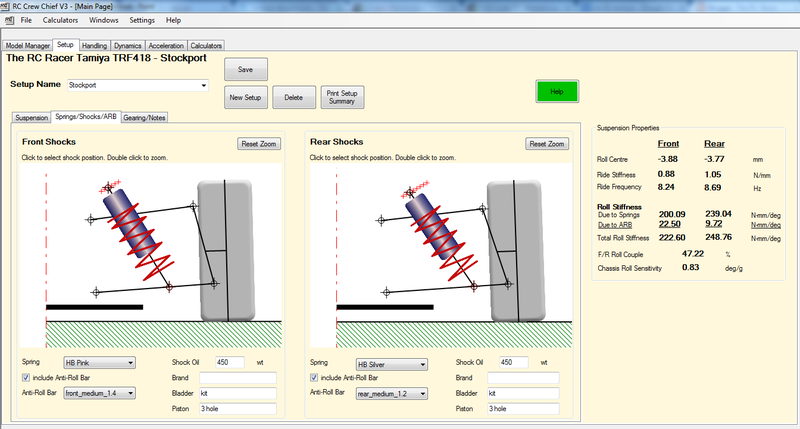 The calculators section is next, and this allows you calculate things like anti roll bar effects etc, to be honest I have not really had to use these. 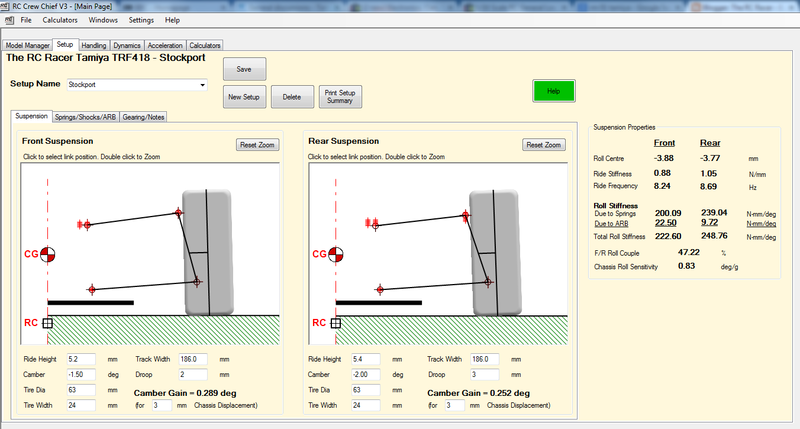 RC Crew Chief is a great piece of software for anyone who wants to delve deeper into the theory of car set-up. It does require some time to get into but it soon returns on the time invested and you really start learning more about the intricacies of true car handling. I have had this software for a few months and have seen a steady stream of upgrades and even now there is a new steering section which will be added soon. This coupled with the excellent support of Bob Wright who answers your emails quickly makes you feel that you are really invested and almost part of a special club of people trying to get the most from their RC cars. With the new year around the corner, why not make it one of your resolutions to learn more about car set-up? RC Crew Chief is the perfect companion for that journey!